In a Nutshell: The Korean Demilitarized Zone (DMZ) splits the Korean peninsula in half creating a buffer zone between North Korea and South Korea. It’s the most militarized border on earth. 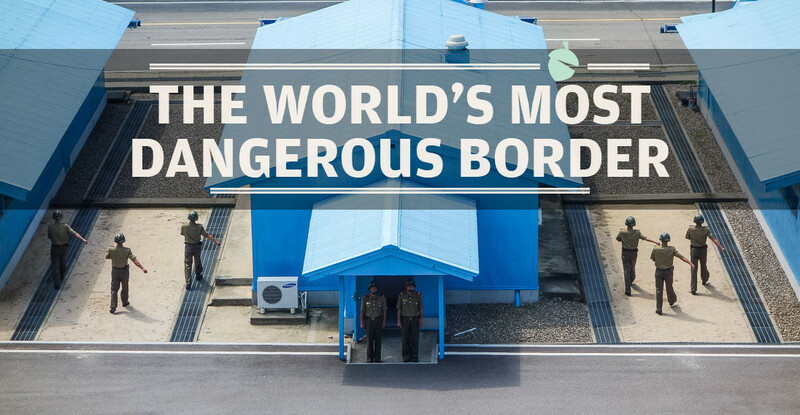 Ever wonder what it’s like to visit the DMZ? Better yet, visit the DMZ from the North Korean side? Let me give you a virtual tour. 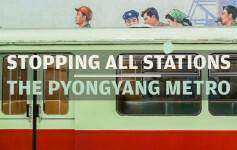 Beginning in Pyongyang due south to Panmunjom, here’s what you can expect on a trip to the world’s most dangerous border. About: I’m Elliott. I’m the tour director at North Korea tour operator Uri Tours. I travel a lot myself, sometimes to the unusual, weird and wacky. Earth Nutshell is where I share my experiences. Interested in visiting North Korea for yourself? Shoot me an email at [email protected]. Barbed wire lined all fences, tank traps enclosed us and the remainder was a laden, active minefield. One million soldiers stood guard overseeing from outposts, gazing across the border into forbidden lands once unified and the eyes of the South Korean military. The peace treaty was never signed, the war between the North and South of Korea still rages over 60 years on, at least technically, anyway, and the Demilitarized Zone (DMZ), the border between two countries now worlds apart, serves as the best reminder. Here in the eye of the storm at Panmunjom a one-metre misstep could see you shot or carted away to a North Korean ‘re-education’ camp. It seems dramatic, but that is the reality. There may not be bullets flying overhead or active servicemen crossing the border, but tensions are high. Since the Korean Armistice Agreement was penned in 1953 there has been over 1000 ‘fracases’ and a further approximate 50 serious incidents here, including one recently where a young North Korean soldier defected into South Korean hands across this very border to the east. It was an exciting prospect to visit the DMZ for myself. I was well versed in the history here and so had clear expectations, however, visiting from the exclusivity of the North Korean side meant a spanner was thrown in the works; I was told to forget all I’d learnt in foreign textbooks about the DMZ and the Korean War in preparation for an ‘alternative’ version of events I’d be briefed on by my Korean People’s Army chaperones. I was told not to argue. I couldn’t wait. Beyond this, I was itching to get a glimpse of how North Korea handled their side of the DMZ. How strict were they? Was it loaded with propaganda? Was everyone on edge? Was physical militarization visible? Machine guns? Tanks? Either way, I forecasted a massive contrast to the tourist-friendly, dumbed down Disneyland-like characterisation you get on a tour from the South Korean side. I just couldn’t imagine North Korea treating the DMZ in such a playful manner. In fact, if it was anything like the rest of North Korea, I can expect to bow at some point, to receive stern looks from all I meet, a set of draconian rules, stringent government minders monitoring me at all times…and military checkpoints, lots of them. 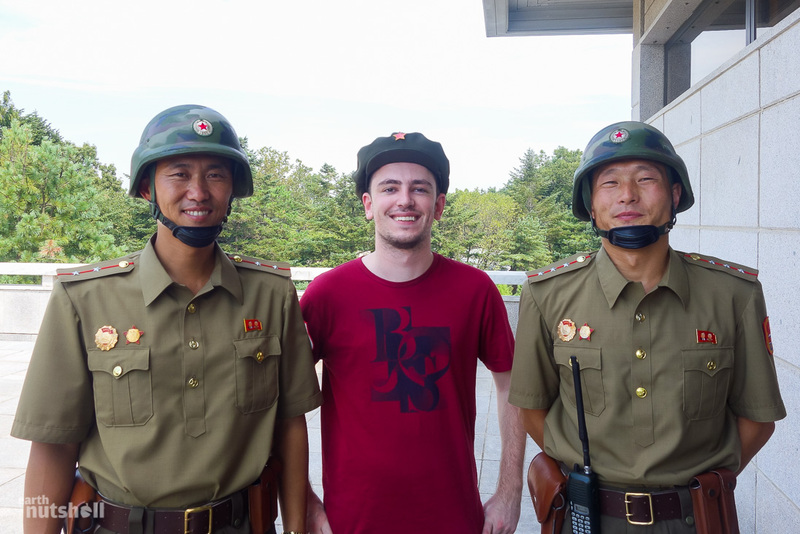 Apparently, though, the DMZ is also the only place in North Korea I won’t be shot for photographing a soldier. Which is cool. I wanted to see how that goes. 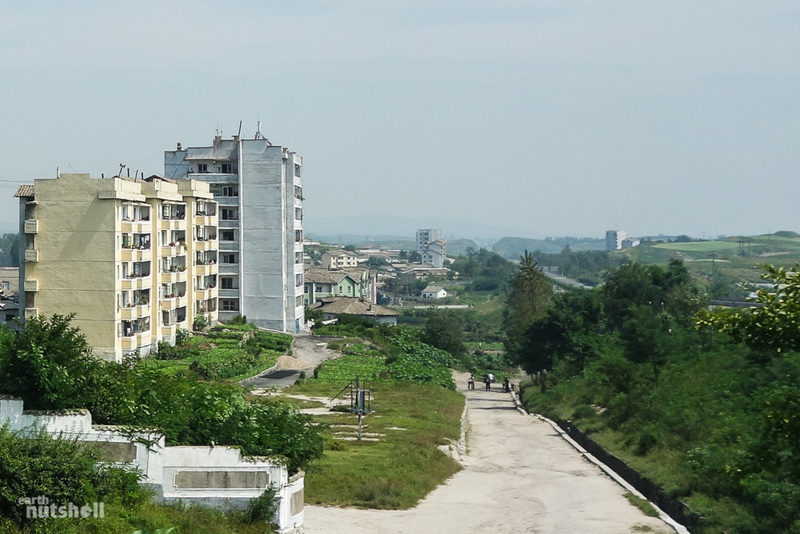 Overnight was in Pyongyang in the fabled Yanggakdo Hotel towering alone on its segregated island in the Taedong River. Away from reality. This meant an 8:15am departure marked the beginning of our three-hour bus trip south, to the most dangerous border on earth. Pyongyang at all hours is dead quiet, only the metallic sounds of factory production and industrial barges break the silence, an eerie mist fills the skyline. The Yanggakdo Hotel lobby populates early for tour departures, mainly Chinese tourists — by 9am the hotel is a deserted, creepy ghost town and the receptionists cut power to the entire 47-floor building until evening. Tourists aren’t permitted in the hotel alone during daytime hours, if you’re sick, you’re assigned a minder and as usual, legally aren’t even allowed to leave. Our hotel to the right, Juche tower in the distance and northern Pyongyang to the left. 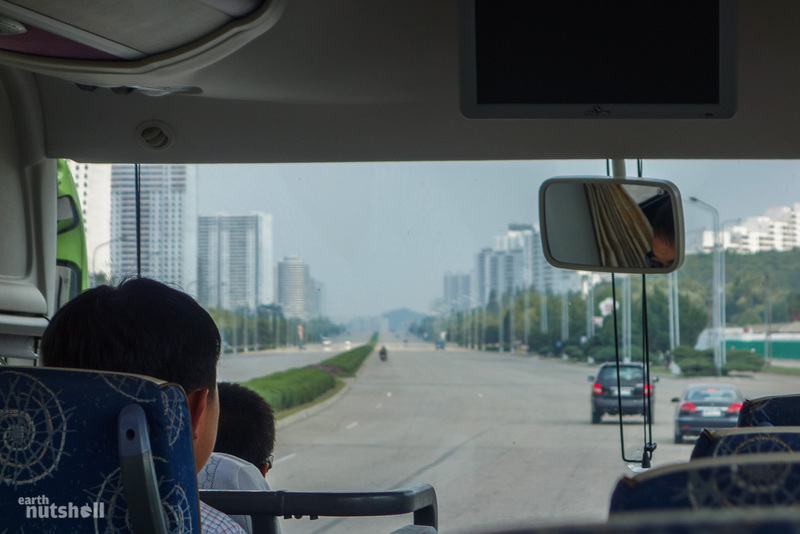 Abandoning island isolation, our bus shuttled across Pyongyang. An exciting day excursion ahead for myself, but for Pyongyang’s inhabitants under the rule of North Korea’s totalitarian regime, it was just another day. 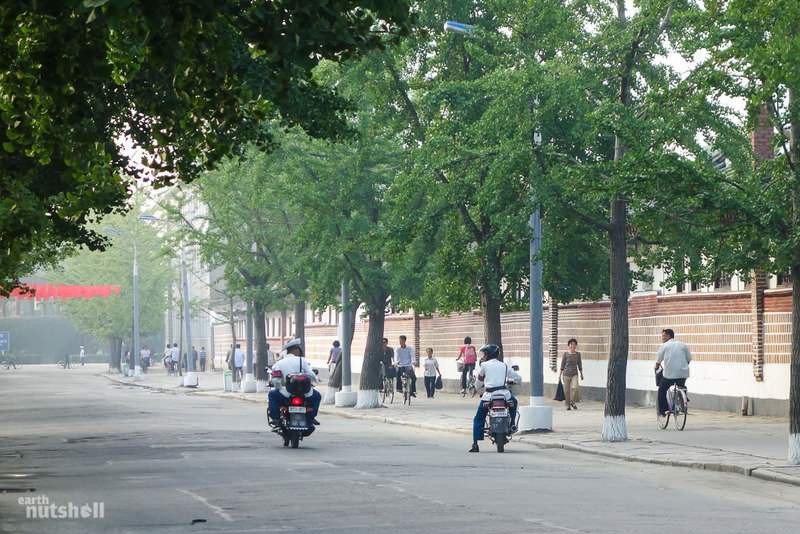 Pyongyang’s working class pack bus shelters in fifty-metre long lines snaking across roads and around corners. Korean People’s Army soldiers can be spotted overseeing mundane tasks, intimidating those sweeping streets, watering or weeding garden beds. Residents roam sparsely, by foot or cycle — everybody moves with purpose. There’s no loitering, gathering or socialising, there’s no litter and there’s no advertising. North Korea would also have you believe there’s no homeless, in reality, people that bring the model city of Pyongyang into disrepute are displaced outside of it. The colour pallet was dull, citizens are styled in monotone dim shades of clothing similar to that of surrounding crumbling, faded Soviet apartment blocks. Green parks and sunny riverbanks are empty. Eternal Leader Kim Il-Sung and Supreme Leader Kim Jong-Il sit on the best real-estate, supervising their Stalinist masterpiece years beyond their death. They’re inescapable, their glowing smiles brightening walls, billboards and murals. They’re personified by statues, on television screens inspecting ginseng cultivation and every room exhibits portraiture of their heads. By law. To say this city is repressive is an understatement. “Long live the great revolutionary traditions of our party, hooray!” — “National Reunification, frequent self-defence.” The Arch of Triumph, Pyongyang. Yep, we aren’t in France. The road out of Pyongyang. Eerily desolate for a capital city. Some Chinese-made vehicles can be spotted. 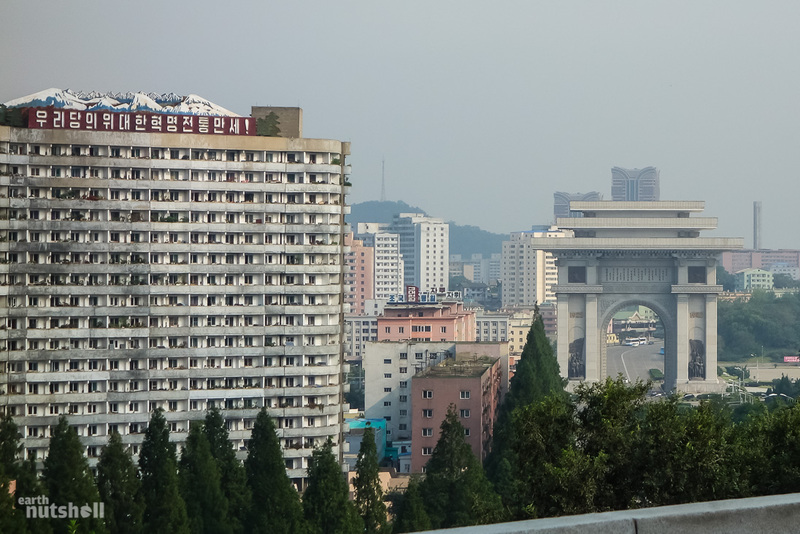 At the outskirts of Pyongyang, we cross underneath the oddly ironic, yet marvellous Arch of Reunification forming a humbling southern gateway to the city. The metropolis ends here. Instantly. It’s akin to bursting through a bubble, a distinct disconnect between the privilege inside and the poverty beyond. What follows is a desolate rural no-mans-land without end in sight. This is the Pyongyang-Kaesong Motorway. 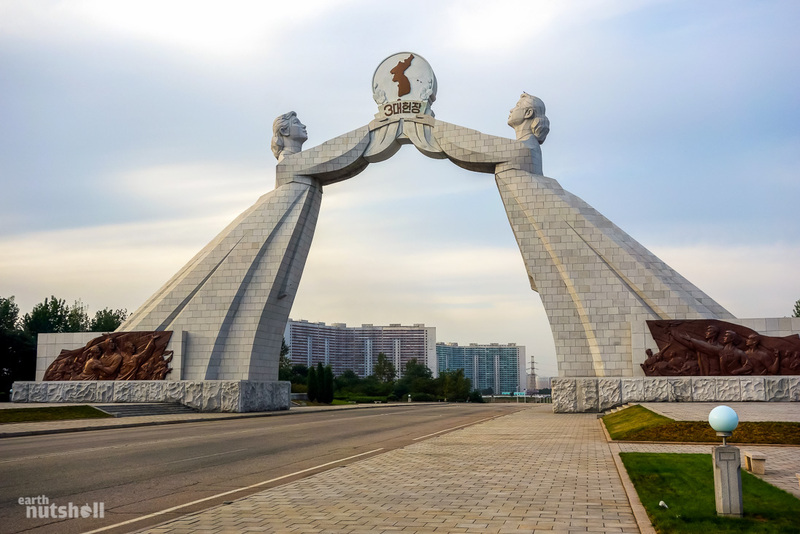 The Arch of Reunification, the southern gateway to the city of Pyongyang. I am facing north looking into the city. Unofficially labelled the Reunification Highway, the Pyongyang-Kaesong motorway is a six-lane controlled access link between well…Pyongyang and Kaesong (through Sariwon), and hence to the DMZ. There’s no traffic to speak of, however as we discovered there’s no shortage of military checkpoints. Creepily, signs on this highway specify distances to Seoul, South Korea rather than the DMZ. I found this fascinating — was it a remnant of a time since passed, or simply a reunification misdirection for the tourists driven down here? I am unsure. You’ve actually likely seen this motorway before, it’s regularly featured in foreign media segments of North Korea, including that Vice documentary you’ve watched. 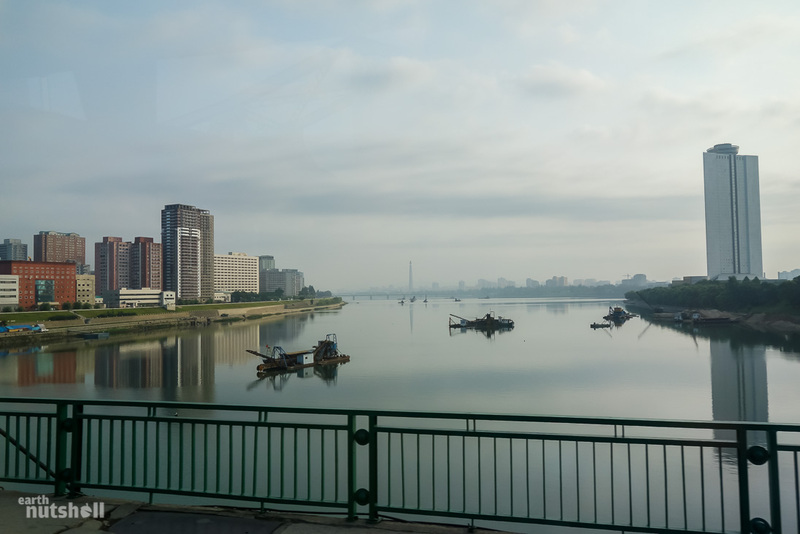 Trips to the DMZ are a mandatory inclusion to most Pyongyang tourism itineraries and is usually the only time tourists are allowed out of the political smokescreen of Pyongyang. After a six-year long waiting list, foreign journalists can also be given permission to film in North Korea and are almost always taken down this route. They aren’t allowed to film out the window. 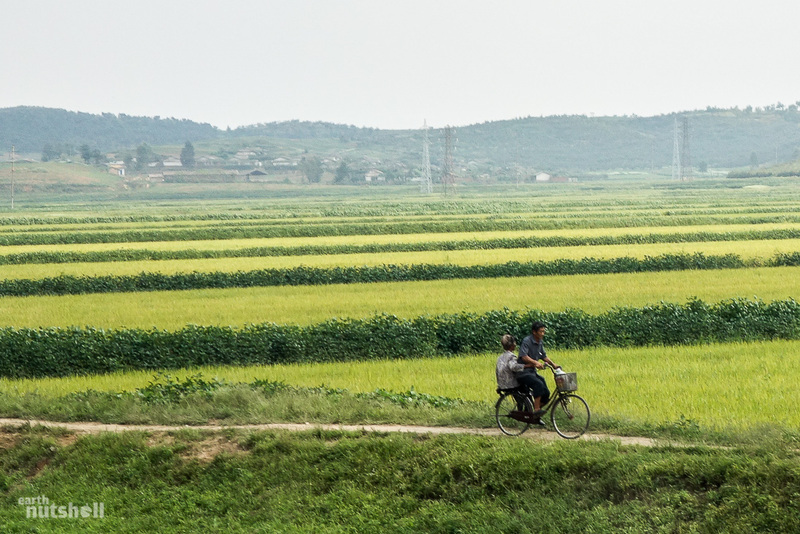 The motorway is almost entirely point-to-point, Pyongyang to the DMZ, conveniently skipping villages, towns and farmland that potentially paint slightly conflicting images of Great-self-sustained-Korea. Rough, pot-holed and unmaintained, true to all roads outside Pyongyang, I found the motorway to be in far better condition than most of North Korea’s infrastructure links. It’s also more ‘sterile’ of propaganda, inspirational banners with quotes from the Kim’s are few and far between in fields or on hillsides unlike the rest of the country. Most notably, however, was how cripplingly lonely the road is. It’s about forty-five minutes into the drive before I come across…well, anything at all. A middle-aged man dressed in a silver suit jacket and pants in the blistering heat, lapel pin of Kim Il-Sung upon his heart. He was bent over heaving a cart up a hill containing a large, live pig. Where he came from? Don’t know. Where was he going? Who knows. The pig appeared proud of itself, though. Activity increased as we descended further south-west past Sariwon (which we visited in days following). Off-shooting villages visible from the highway finally breathed some life into the barren countryside and were accessible only by walking tracks. People wandered the roadside alone on foot or by bicycle in a daze, sometimes tens of kilometres from the nearest inhabited community. I spotted locals with sacks of corn, bundles of sticks and leaves, sand, livestock and fruit baskets. Supplies are limited in North Korea and act as the primary currency among the countries impoverished. There is a market economy that’s flourished within North Korea over the last twenty years since the famine, but bartering is the norm for those outside major cities. Similarities between less fortunate South-East Asian countries such as Laos could not be dismissed. I witnessed many exhausted locals pushing broken down motorcycles for miles out here — reliable equipment and fuel are commodities as scarce as hen’s teeth. It dawned on me just as it had done in rural Vietnam, that falling gravely sick in the countryside was essentially a death sentence; hospitals may be hundreds of kilometres away and without vehicles, and with enforced freedom of travel restrictions, people would be lucky to get medical attention. Only those loyal to the regime with clearance can enter Pyongyang. Living in rural North Korea was evidently a harsh lifestyle. Pyongyang tells little of the real story. Halfway passes and we take a break at what the guides and most foreigners know as the Tea House (Sohung Rest House). For those readers familiar with that Vice documentary on North Korea, it may be recognisable. It’s the location of the ‘Tea Lady’ segment, which I may add was vastly exaggerated on their part as a ghost town. 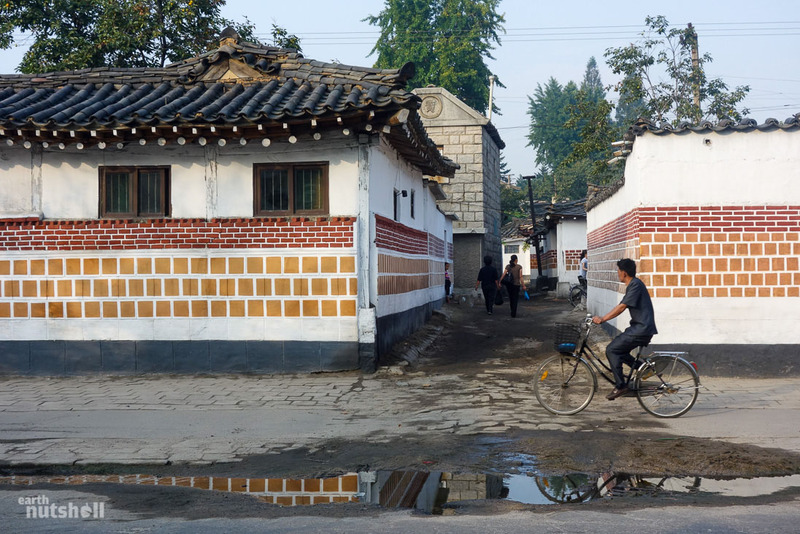 In reality, Sohung Rest House sees regular visitors — it’s the only sanctioned stop between Pyongyang and the DMZ. Nonetheless, it’s a cool feeling to be in such a secluded yet familiar place. Sohung Resthouse, the only sanctioned stop off between Pyongyang and the DMZ. Vice filmed ‘The Tea Lady’ segment of their documentary in that room to the top left. After enjoying some tea poured by enthusiastic ladies pleased to handle foreign currency, replenishing my soft drink supplies and dry-reaching from the frankly disgusting toilets that lacked ventilation (I’ll save you the descriptive writing) we were back on our way down the deserted highway. Farm villages start to rear their head. 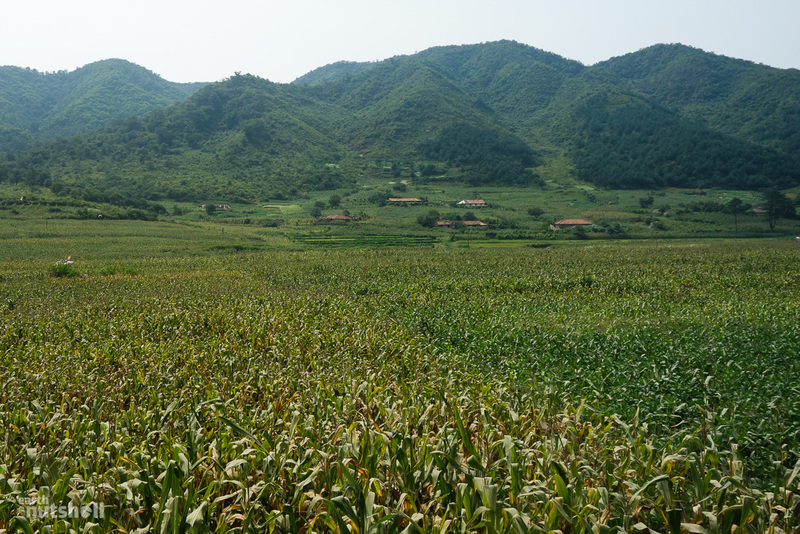 There’s lot’s of corn crops here, North Korea’s speciality. A path leading out into remote village communities. All transport is foot or bicycle. There were no cars and motorbikes looked more like antiques and were just as reliable. Questionable dwellings, but this is about as good as it gets outside Pyongyang. No photos were allowed from this point onwards until the DMZ. This rule was strictly enforced. We were briefed that today wasn’t one for sneaky snaps out the window. Upon leaving Pyongyang, I saw trains hidden by tall barriers above which the upper half of military tanks were clearly visible. The guides spotted this too and as we passed, all guides turned to watch us like hawks to ensure stealth photos weren’t taken. It’s no joke. It’s their heads on the chopping block if we don’t abide by the rules. The guides in North Korea are essentially an extension to your own responsibility. They take the fall for minor crimes on your behalf. Military checkpoints began to appear in rapid succession. Four leading up to the city of Kaesong about 20 minutes apart. This was before we even arrived in the vicinity of the DMZ itself. Good grief, what is it going to be like once we get there? Each checkpoint gated off the road splashing Korean signage widely enforcing a stop. They were a simple, yet unsettling process involving the driver passing across papers to an AK47 toting KPA (Korean People’s Army) soldier dressed in military olive green get-up, complete with a peak cap and a whole lot of attitude. Our role was to sit in deathly silence, look ahead on our best behaviour and ensure anything with a lens quickly became invisible. 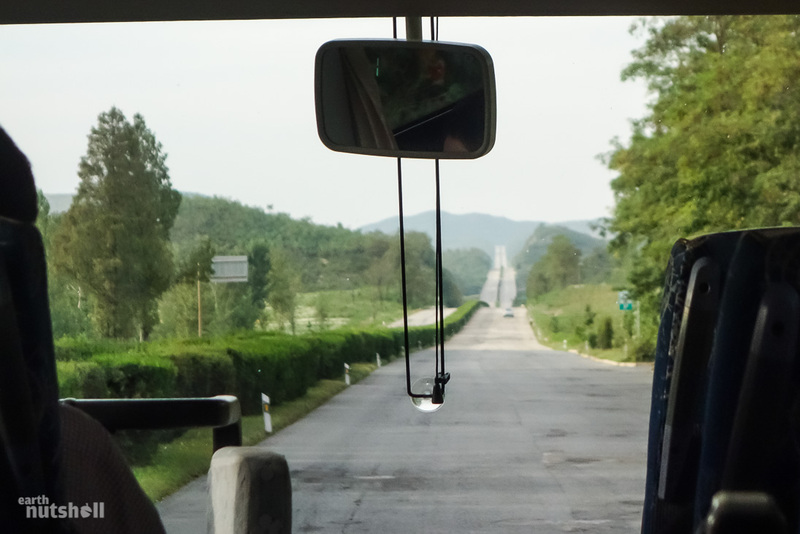 Unless of course, a bus shakedown in North Korea was on your bucket list. I’d rather not. At least not now. All things considered, these checkpoints are a slight inconvenience at most. Yet, they are an intimidating process but I think that is the point. It’s worth noting that these checkpoints are not for foreigners. As a direct line to Pyongyang, the motorway is well contained and those using it must have purpose and approval. Overgrown and forgotten. Nearing the end of the Reunification Highway. Working vehicles outside Pyongyang were rare, but it was commonplace to see people fixing old trucks, cars and 1920’s antique farming equipment by the roadsides all over the country. Every time you passed one, there’s always numerous sets of legs protruding from underneath as all occupants tried to get it back on the road to the next village mechanic. Today we pass such a victim, but one that was familiar to the guides — a Chinese KITC tourist minivan joining us for our timeslot at the DMZ. They waved us down and five minutes later our bus was back on its way joined by eight new occupants. Not sure about the minivan driver. He stayed behind. Likely discussing terms of his contract on a call to the insurance company, I bet. Not long after, we reach Kaesong, a city just a stone throw away from our DMZ destination of Panmunjom. We are told that Kaesong will be where we’ll be staying tonight, sleeping on floor mats in traditional historical Korean dwellings. 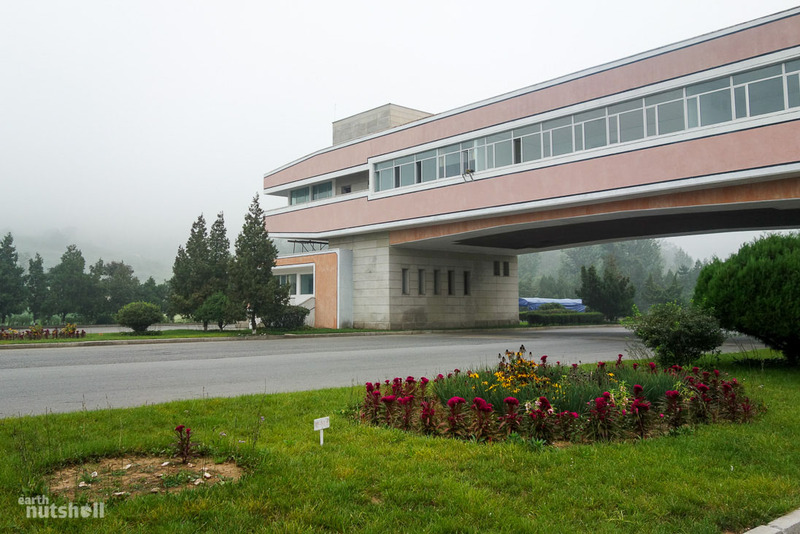 Due to its proximity to South Korea, Kaesong provides an interesting role in the economics between the two nations including the morally questionable Kaesong Industrial Region where South Korean companies employ North Korean labour for a pittance on DPRK soil. As we pass through, one guide points out Kaesong Train Station. The tracks lead directly through the DMZ to Dorasan Train Station in South Korea, linking eventually to Seoul. It’s romanticised on the South Korean side as “Not the last train station from the South, but the first station towards the North”, but on the North side, it’s a forgotten and overgrown station since abandoned after political conflicts in 2008. It’s hard to stomach it’s existence right in front of my eyes, these tracks represent a literal link between long lost relatives segregated across this tiny border just two hours apart. 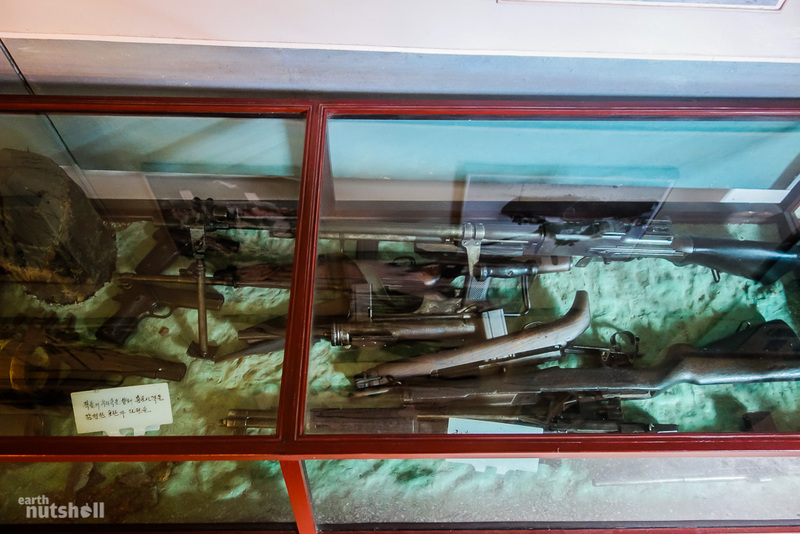 In most areas of the world, you’d hop on the train and be with your family in time for a late breakfast, but between the two Korea’s it’s impossible — one million rifles will do that. Police officers having a discussion on the barren streets of Kaesong. Colourful traditional housing in Kaesong. Taken from the bus window as we pass through. We are again sternly reminded “no photos, no photos!” as we enter the preliminary area of the DMZ. With a keen eye, the towering flagpoles of both North and South Korea can be seen in the distance less than four kilometres apart, the width of the DMZ splitting each nation. We embrace yet another (and final, yay!) checkpoint, bringing it to a grand total of seven from Pyongyang to DMZ, not bad. We soon come to a halt at the suitably communistic-looking gate pictured centre below greeted by a mural of a large pointed finger subset by the slogan “Korea is One!” My Korean is limited so for all I was aware, it could have represented a player being given out at Lords Cricket Ground. Now I can’t unsee it. My first thought after seeing this mural was the irony in that we were standing aside a 4km wide, 250km long minefield purely designed to keep the North and South of Korea away from each other. Call me cynical, but Korea seems everything but ‘one’ to me in this moment. Oh well, it’s good to see the glasses kept half full. 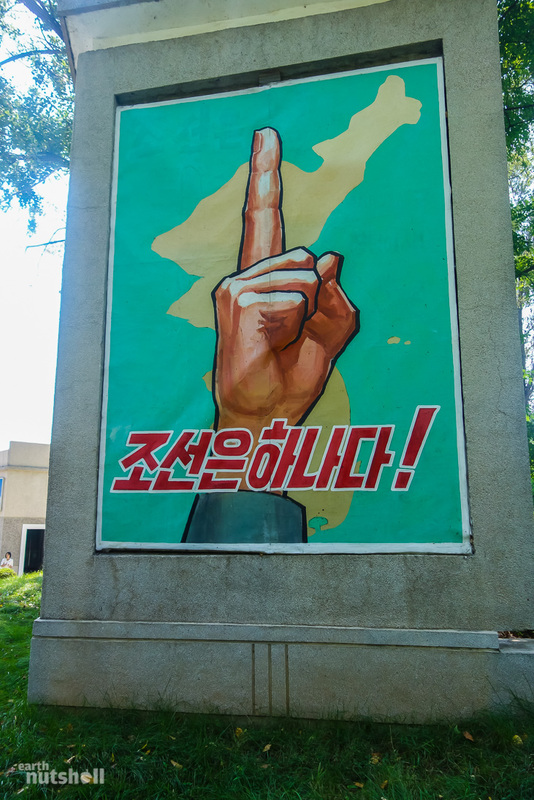 “Korea is One!” The first mural you see at the DMZ entrance. Now that we are here, there are three sections of the DMZ which I want to make clear, mainly because they confused me initially. I might not be the only one. There is the Demilitarized Zone (DMZ) itself — this spans the entirety of the border, sea to sea. It exists as a 4km wide buffer between both Koreas. Centred on this DMZ buffer zone is the Military Demarcation Line (MDL). This is the actual political border. Overstepping this line is not a place to show your passive aggressive push for reunification — you’ll be shot. The MDL line is not accessible at many spots along the DMZ due to the minefield on both sides. A North Korean citizen that would like to defect to South Korea would have to gain access to the MDL. It’s incredibly challenging and dangerous unless you’re in the military and have been posted there and even then, this will only happen if you are from a loyal background and have sufficient family ties — this way you are easily blackmailed into not taking the leap. Today we are visiting the MDL through a special accessible section of the DMZ known as the Joint Security Area (JSA). It’s located to the west of the (now uninhabited) village of Panmunjom I’m currently standing nearby. What makes the JSA so unusual is that it’s the only area where the North and South come so face-to-face they could legally kiss. I’m progressive, I’m all for it, but that hurdle may not be a priority right now for some reason. Kim Jong-Un may be eating extra lobster tail this week thanks to that 10 euros. I shouldn’t joke, I mean it’s directly funding the regime, you’re right. But with the Kaesong Industrial Region nearby I felt somewhat less guilty. As I walked out, ‘Crazy O’, one of my guides, the son of a diplomat, guide of Dennis Rodman and Australian larrikin in North Korean skin, spotted the Ginseng and let off a snicker, some not-so-subtle innuendo and an ‘interesting’ mime. Why? Well, apparently Ginseng is used in Korea for impotence. Ahh, the International Friendship Exhibition incident, and now this. I just can’t win! 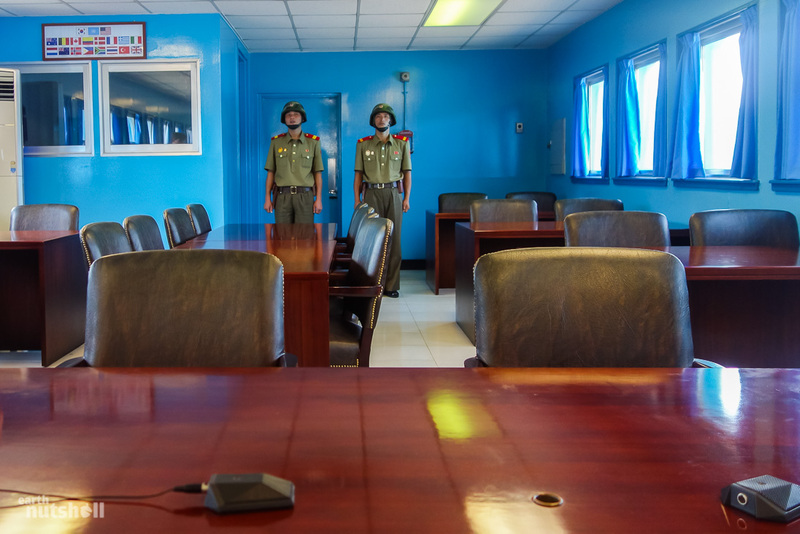 An empty connecting room displays a map of the DMZ and the Korean Peninsula. It’s overlooked by individual photos of Kim Il-Sung and Kim Jong-Il. Note how the frame is thicker at the top so that the leaders are always looking down upon you. These stock portraits are in every household and business. This, too, is a requirement by law. 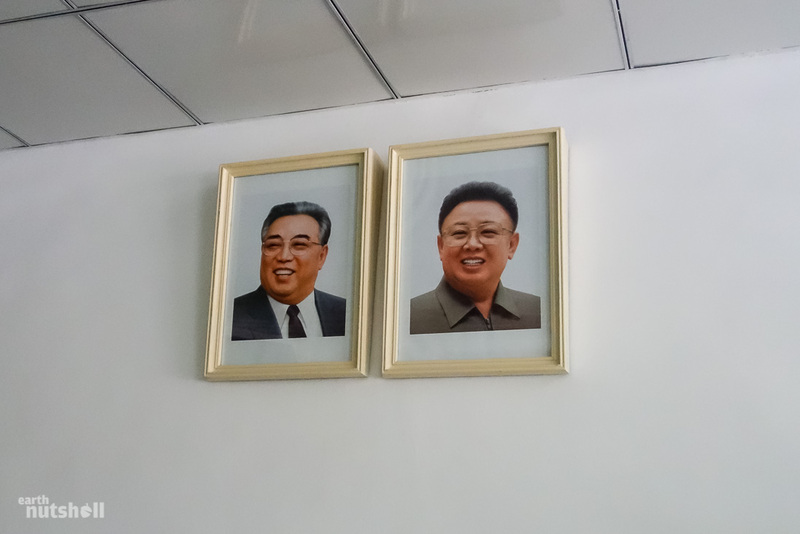 Framed photos of the leaders inside the DMZ staging area. Legally required to have a thicker frame at the top to look down upon you. As we waited for authorisation, it suddenly dawns on me — could I get cell phone signal here? We are right on the border…surely South Korean tower coverage reaches. My iPhone has been on flight mode since boarding the plane in China to Pyongyang because well, as we know, North Korea is a communicative black spot. Sure enough, disabling flight mode showed a two-bar signal to a South Korean cell carrier and I instantly received an automated roaming SMS and one I was sent days earlier. …And very illegal under North Korean law. After some fleeting feelings of ultimate badass-itry, I set it back to flight mode before I get carted away for ‘spying’ using a ‘GPS Device’ as a ‘puppet’ of South Korea. Or something equally ridiculous along those lines. Alright, with the bus searched and cleared of nefarious products, we are lined up and marched single file through the gate into the DMZ itself. 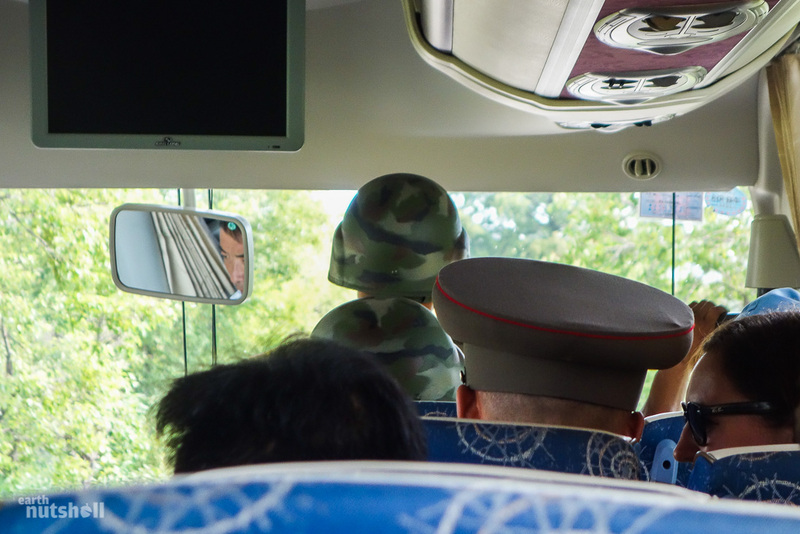 The bus follows and we re-board with a Korean People’s Army (KPA) colonel and two KPA soldiers to accompany us towards the JSA. We are getting into the real deal now! The path we take is set below ground level, built up on both sides by brick, it was one-way and only wide enough for the bus and driving within it made me feel like a rat up a drainpipe. Atop of these girders sit huge bulk blocks of stone and the gaps between are filled in by barbed wire and electric fencing. Behind it on both sides appeared peaceful — lush, long green grass where nature has reclaimed land and is devoid of anything, not even any crops. That’s because it’s a minefield. The bus currently sit sandwiched between two desolate fields that form just a small section of the approximate 3 million landmines present across the entire DMZ. Oh and those stone blocks? Those are tank traps, our guides acknowledge them to be rigged with explosives and a necessary evil to prevent military pressure bypassing the fields and streamlining through this paved gateway into North Korea. Korean People’s Army accompanying us on the short drive into the DMZ towards the JSA between tank traps and an active minefield. Although North Korea have placed a majority of the mines, they’re also the ones with a track record in circumventing them. The result is a set of four known infiltration tunnels North Korea dug underneath as invasion paths into South Korea, El Chapo over there in Mexico may have gotten some inspiration here from Kim Il-Sung. As you’d expect, after being discovered South Korea locked them down but the third one, in particular, was concerning as it came within just 44 kilometres of their capital Seoul. From the South side on a DMZ tour, you even get the chance to go into one. From the North? Their existence is not acknowledged. Guides have never heard of them. What’s incredible is that there’s a chance that not all tunnels have been discovered, there could still be hidden passages facilitating people in and out of the country as I type. It’s unlikely, though! 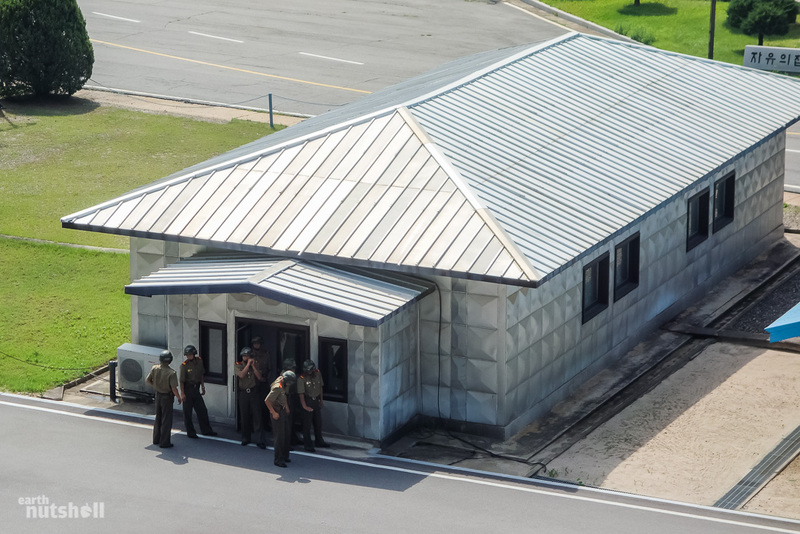 The Panmunjom checkpoint within the DMZ heading to the Joint Security Area (JSA). Note the infamous 160m flagpole in the distance. Halfway into the DMZ, we make a stop. 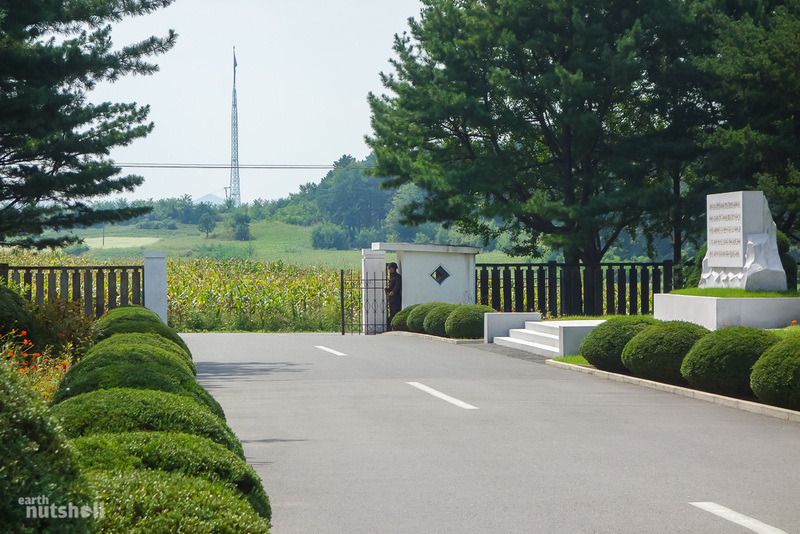 This is the actual location of the late Panmunjom village — there is now nothing left. 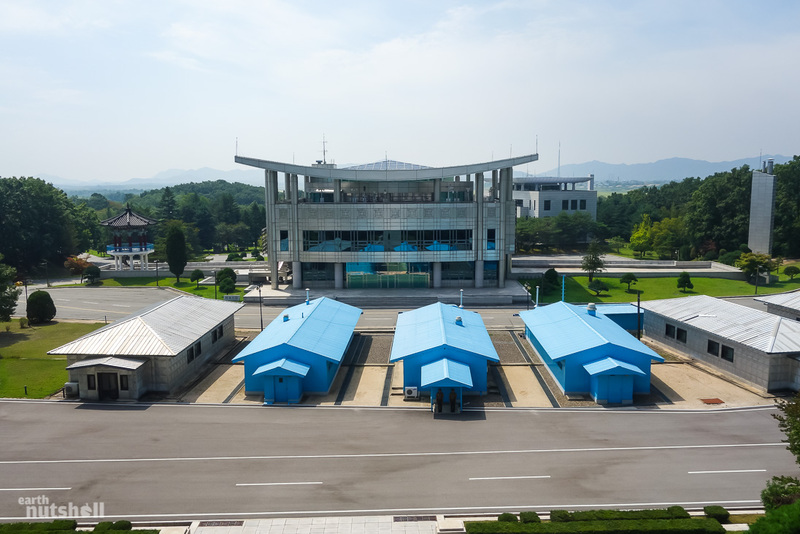 A single military outpost has been erected, pruned gardens line the entrance, and two buildings sit within the vicinity. One being the Negotiation Hall where peace talks were held during the war (the original table exists here) — and the other, the (now) North Korean Peace Museum, which is where the Korean Armistice Agreement was finally signed and history was made. We’re told it was built overnight by the great Workers Party of Korea for the sole reason of facilitating the signing. Something interesting to note in the image above — see the giant North Korean flag towering in the centre? This is sitting in one of only two villages agreed to remain within the DMZ: Kijongdong in North Korea and Daeseong-dong in South Korea. 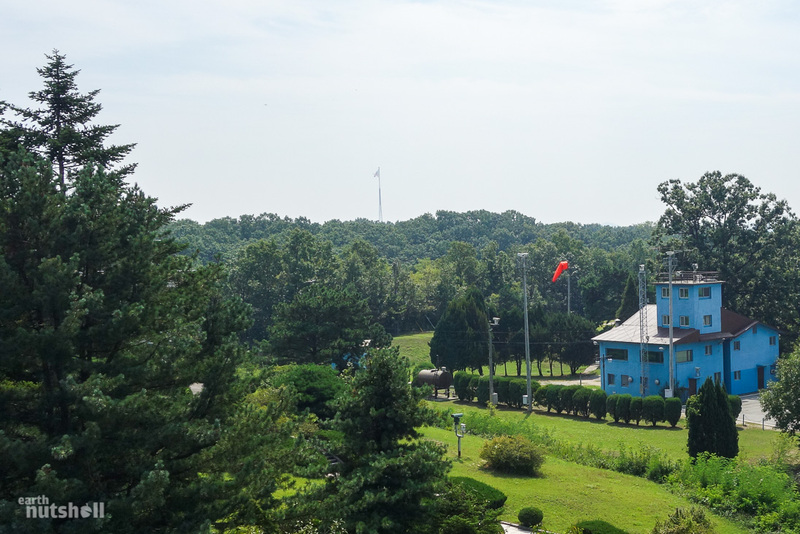 In the 80’s, South Korea built a 100-metre flagpole on their side of the DMZ, North Korea then took it as intimidation and upped the ante by building the one pictured themselves, much larger at 160m and almost the biggest in the world at the time. A flagpole war. Much more peaceful. 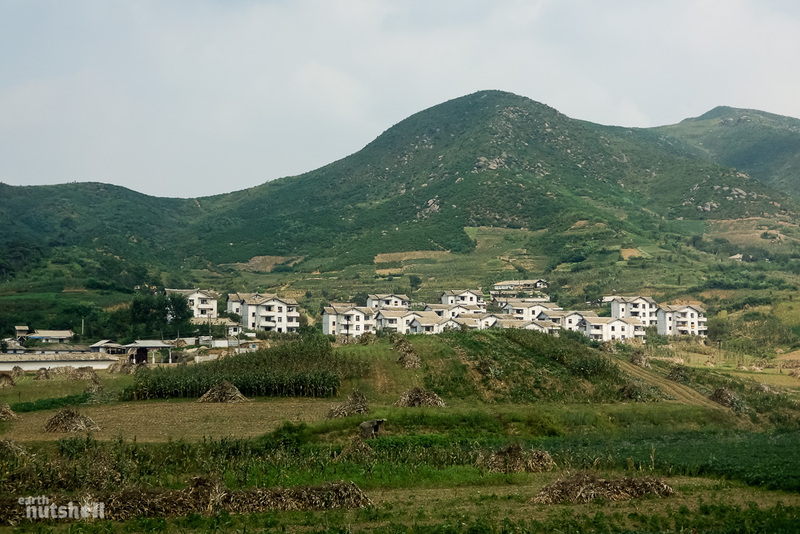 Unfortunately, North Korea also used that village right up until recently to blast propaganda at the South twenty hours a day, droning away to tired officers to jump the border and enjoy heaven and luxury in the North. I’m not joking. Unsurprisingly it had little effect. It’s been proven that the lights in this village are on timers to give the illusion of activity. It’s now dubbed as ‘Propaganda Village’ from the South for obvious reasons. South Korean Flag in the distance. The MDL is the line of plants near the surveillance camera. Cross this and you’ll get shot and mess up these otherwise serene gardens with your imperialist blood. We first checked out the negotiation hall. On the outside, a sign denotes when Kim Jong-Il first visited this location. This is more of a prelude to the museum than anything — inside contains just the original table, ten white veiled chairs for negotiators, and another two smaller offset tables for officials and that’s about it, nothing riveting but it’s historically relevant. It was built for this purpose only and it remains. The irony in North Korea going to these lengths to preserve the history and integrity surrounding the Armistice agreement is something special, I just can’t look past it. It’s been six times now they’ve announced their unwillingness to abide by the agreement, even as recent as 2013. Ah, politics. It’s quite clear this little checkpoint is used as a propaganda machine, a celebration of the ‘victory’ of the North Korean people over the ‘imperialist’ Americans. This becomes clearer at the museum next. KPA Colonel and I within the Negotiation Hall. Cute little tie! 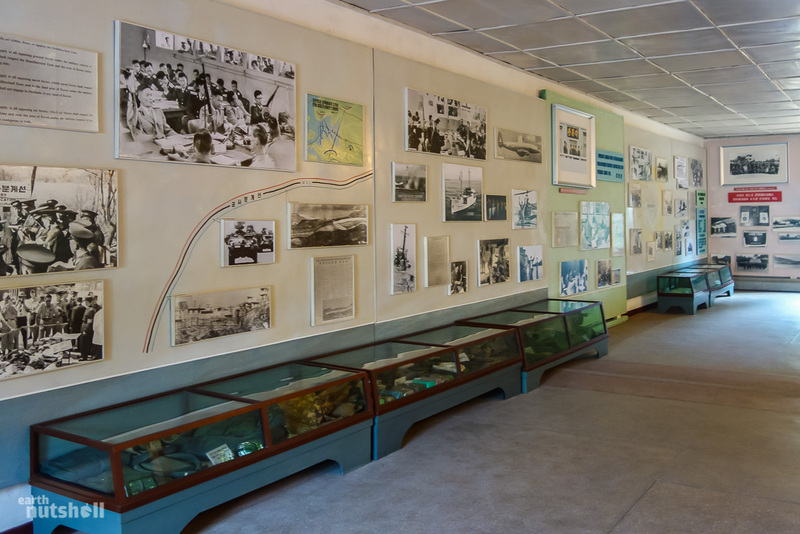 The North Korea Peace Museum is one room containing three tables. The guides stress they are all the originals, still exactly as left since 1953 with the addition of the armistice agreements and flags within glass casings, of course. 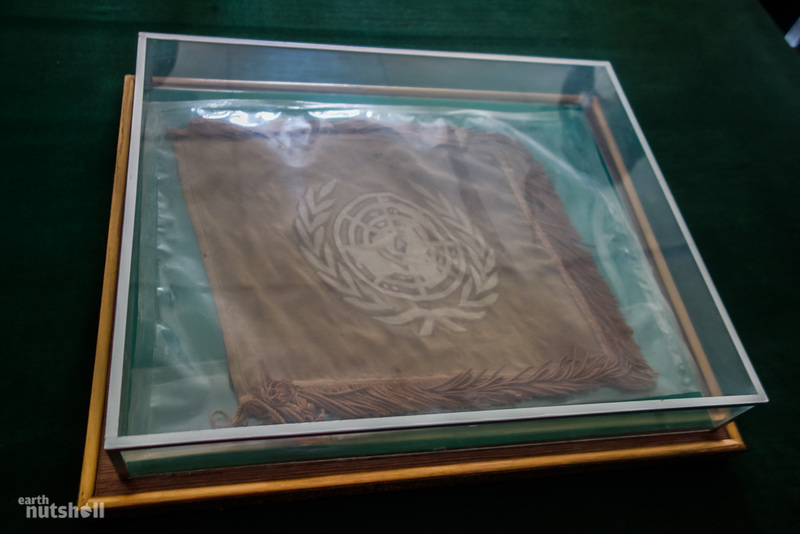 A funny observation I couldn’t help but make is that the ‘original’ encased UN flag looked to have seen better days, a little worse for wear after this long. That’s expected, but meanwhile, the North Korean flag on the other table was an absolute cracker, looking brand spanking new, not even a fade in colour. I didn’t question why because I already knew the answer: It was the superior materials that go into the local North Korean product, clearly. Just one wall of ‘carefully selected’ historical photos within the North Korea Peace Museum at Panmunjom. The battered UN flag, it’s seen better days. Walls inside the museum were lined with photography. Most were given context with Korean captions that I, unfortunately, couldn’t read. But it was chronological. A celebration of the war ‘victory’ (remember when I said to forget our version of events?) of the Korean people leading up to the formation of the DMZ and beyond. The word ‘objective’ isn’t one I’d use to describe the museum, not that I expected otherwise. On the walls Americans are shown with their hands up in surrender, there is ‘evidence’ of American aggression and spy activities, Korean People’s Army soldiers shown training and on the battlefield defiantly, grayscale images of civilian celebration and endearment to the cause, and, of course, pictures of Kim Il-Sung doing what he did best, spreading his political wings by shaking hands, signing documents and leading his party to victory and the armistice finale. Kim Jong-Il also has his own wall dedicated to the visit he made, shown in bright colour photography. This visit by the Supreme Leader is recorded by date and time and hits you in the face as you walk in the door. 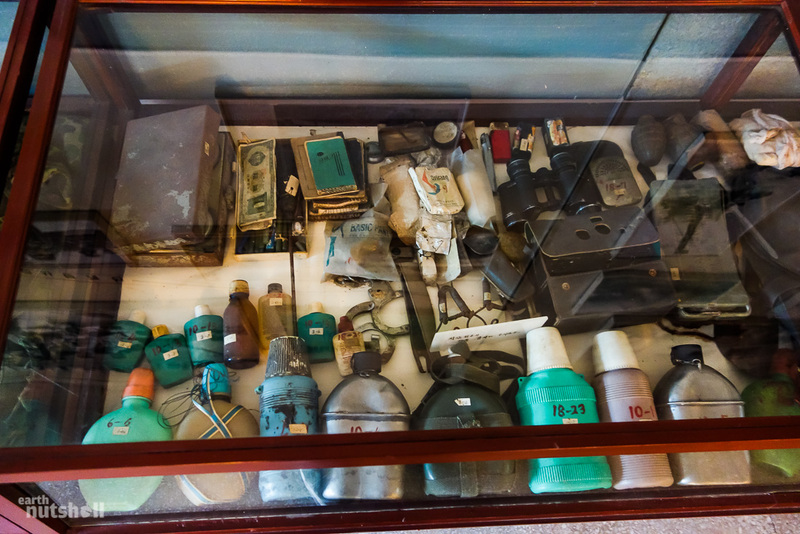 Exhibits of physical items (or evidence as the guides will describe them) cluttered the perimeter of the room below the photos and were filled with American and South Korean war materials. They even showcased the axe used in the infamous ‘axe murdering incident’ in the JSA where two Americans were hacked and slaughtered with it by KPA soldiers for cutting down a tree in line with a military outpost in 1976. Americans are presented as cowards, South Korean ‘puppets’ are slandered and China isn’t mentioned. North Korea is presented as the victim and victor under the wise guidance of Kim Il-Sung. The North Korean tunnels under the DMZ also evade acknowledgement, yet the elusive unicorn of the ‘Concrete Wall’ allegedly built by the Americans in South Korea is mapped out perfectly. 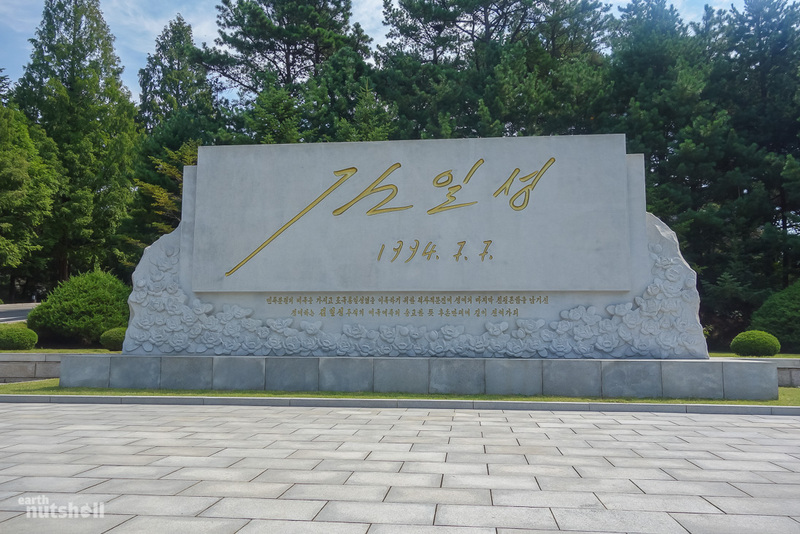 The American imperialists, who broke out (provoked) the war in Chosun (Korea) on the 25th June 1950, surrendered on their knees in front of all the heroic North Koreans and signed here the armistice on the 27th July 1953. Remnants or ‘evidence’ from the ‘surrender’ of the American Imperialists. There’s even a US dollar bill to the top left. More American ‘evidence’ from the war. Another 500 metres or so and we were at the JSA. But not before the bus almost broke down as we pig-rooted our way up the incline preceding it. I tell you what, it’s no wonder cars in North Korea barely run, the drivers here have very little respect for manual transmission. We are dropped off behind the Panmungak Hall. This is the large white building that faces you if you were visiting the JSA from the South Korean side. Both South Korean and American guides previously enjoyed toying with tourists by telling them this building was a farce, a fake front just like a movie prop. This is because from your vantage point in South Korea you can’t see whether the building has any depth. So, if there was any doubt in your mind I can confirm with authority that it’s indeed a brick and mortar establishment with a heap of rooms. Upon disembarking, we are instructed to walk single file once again. It’s very organised and official. First impression: It’s incredibly peaceful and relaxed here at the JSA. Serene really. It’s silent, and their best landscapers have left their mark as it’s now a beautified tourist landing pad. Unless you knew prior, you wouldn’t have an inkling of the surrounding dangers. A scripted walk followed onwards to an adjacent stone monument. Based on the guides mannerisms, this was obviously an important monument. In fact, we discover it’s a memorial to the Eternal President himself, Kim Il-Sung. Who’d have thought? Etched into the stone in bright gold is his final autograph scraped from his last endorsed document on the 7th of July, 1994. Apparently, it’s an analysed direct replica. It appears he was quite the neat writer, it’s scaled well to this size. The document? You know the drill. It was a proposed one ‘country-two systems’ reunification proposal. Of course. He died the following day though unfortunately. Shame. Other than this, and discounting the stock portraits present inside rooms of the Panmungak Hall (par for the course), shockingly there is no other Kim family photos, inspirational quotes, banners, leaflets, signs or statues at the DMZ. No face-value propaganda at all. Honestly, this was unexpected. I know that if I were Kim Il-Sung, the first thing I’d be doing is erecting the largest bronze statue on earth of myself right where those tourists on the South Korean side gaze over the border. I feel he missed a great opportunity. Kim Il-Sung’s final signature transcribed into a memorial at the entry to the Joint Security Area (JSA). Led by the KPA Colonel, we shuffle through the Punmangak Hall and out into the photogenic central area of the JSA. The border is where the light gravel turns dark, denoted by the concrete line visible in the photo below – cross that line, you’ll be shot. A Soviet tourist during the Cold War tried it in 1984 ending in four casualties. So it’s not recommended. You are looking across into South Korea. This is the Joint Security Area (JSA), it straddles the political border (MDL) within the DMZ. The border is where the light gravel turns dark, denoted by a concrete line. The buildings are halfway in each Korea and the large building ahead is the American/South Korean ‘Freedom House’. North Korean soldiers preparing for our arrival at the Joint Security Area (JSA). Exemplary North Korean soldiers, complete with hardhats and a great poker face are awaiting us. Two precede us in entering the bright United Nations blue conference room before both taking up positions at the end of the room guarding a single door like statues. Akin to the Queen’s Guard in England, I thought. They are each within arms reach of a pull alarm. The door they are to guard? This is a door to South Korea, quite literally. Like the door to Narnia, except real. Just one door knob and a hail of gunfire away from a new life. If they were so inclined. So close yet so far. A single door away from relative freedom. I noticed even the exemplary KPA officers appeared quite thin in North Korea. 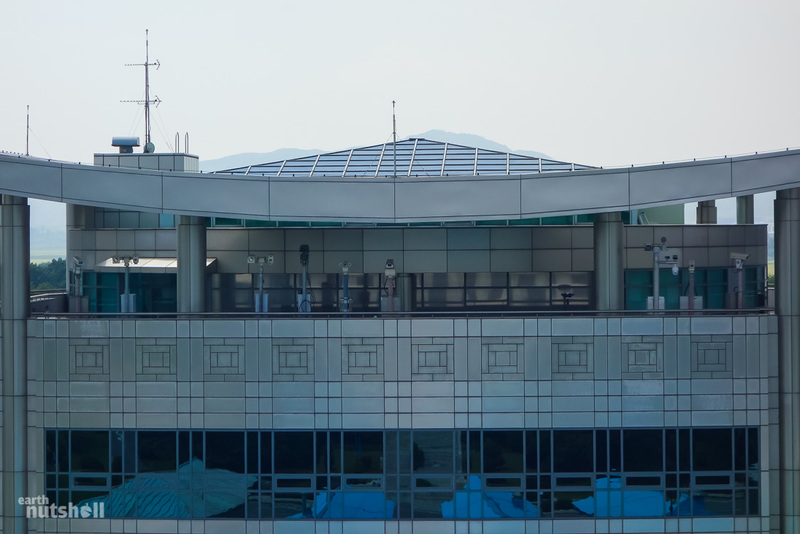 The conference rooms are infamous, they’re synonymous with the DMZ in the pop culture of not only South Korea but on a global scale. They hold novelty value to tourists while providing such an important step to reunification. They straddle the Military Demarcation Line (MDL), half in North Korea, half in South Korea. This means that the JSA is the only area in North Korea one may peacefully and theoretically “cross” the border into the South — cool right? Well, sort of. There’s a slight caveat, crossing the MDL can only be done within the constraints of these blue conference rooms. 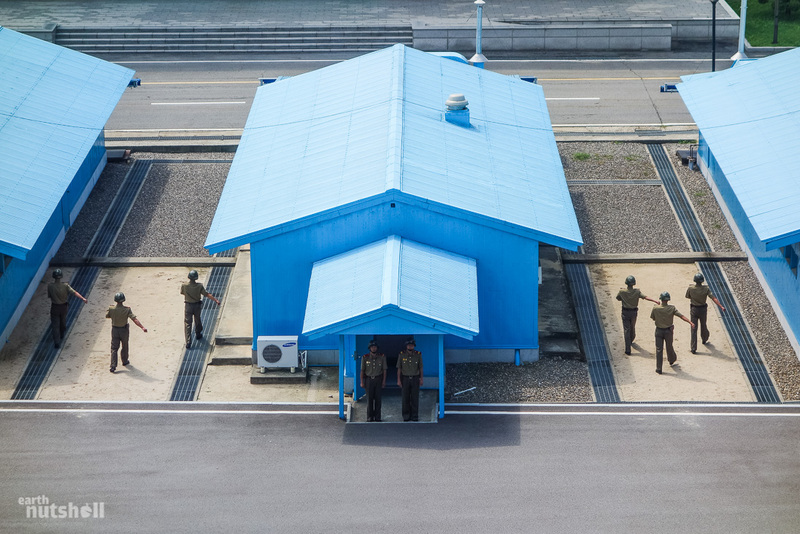 The two sternly looking KPA blokes are technically standing in South Korea in that photo, shielded from the political storm by just four walls and a roof! Freedom is short lived, you can’t even tell whether the air is fresher over that side. For those that visit the DMZ from the South Korean side, yes these are the same rooms where you can ‘walk into North Korea’. 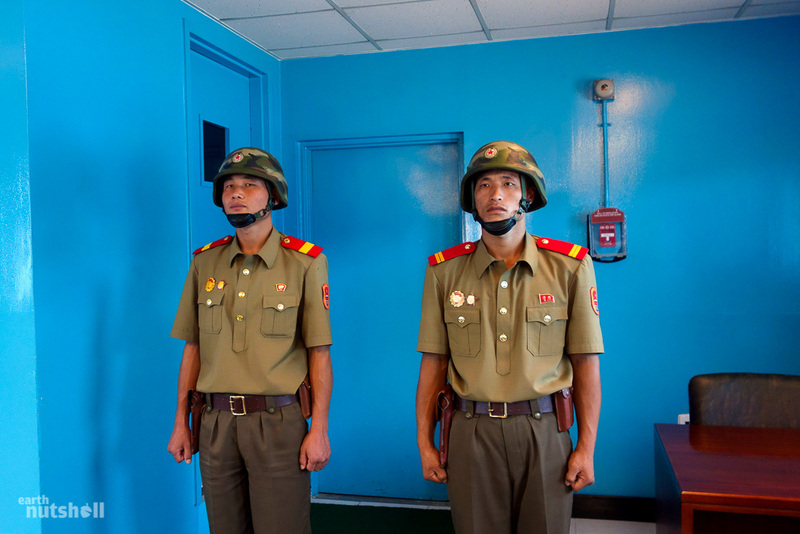 North Korean soldiers will not be in the room, instead, South Korean soldiers will guard the opposite door to North Korea so you aren’t tempted to immigrate illegally into Kim Il-Sung’s haven of freedom. Try to resist the temptation. These rooms do have a proper purpose, though, they provide a relatively neutral, peaceful platform for face-to-face political negotiations between both Koreas. If they can ever get it organised that is. It rarely happens due to politics and bureaucracy, but prisoner exchanges have also been known to occur here and this is as close to North Korea as the United States diplomats and heads of state are willing to go. The inside of a Joint Security Area (JSA) conference room. I’m seated at the negotiation table facing the door to South Korea, guarded by two KPA soldiers. The centre of this table, roughly where the microphones are sitting, is the MDL. Seated as an international delegate, the Colonel gave us a similar introduction as I’ve given you into both the JSA and the conference rooms before linking them back to a politically-laced rundown on what the DMZ represents to North Koreans. This meant another brief on North Korea’s victim-complex starring their imaginary efforts at fostering reunification which is being maliciously denied by the imperialist Americans and ‘puppet’ South Koreans. It’s relentless. His description of events leading up to the DMZ still omitted any allusion to China at all and their role in saving North Korea’s bacon, securing the DMZ and ensuring continued communist rule in the North. It’s alright, I’m sure he just forgot. We all make mistakes sometimes. The South Korean side of the JSA was empty. No South Korean or American military nor any tour groups were visible. In fact, I saw no movement at all on that side of the border. This was a shame, it would have been nice to see the face-off, if not just for photos. I mean…there’s just a couple metres between opposing soldiers all day, I wonder what the interactions are like. Do they want to strangle each other? Do they talk to each other? Are they friends? A game of football with a very strict offside? I doubt it, but today I’d get no confirmation. What I do know however is that the imperialist Americans and puppet South Koreans weren’t, in fact, off enjoying their free-market screening of the new Transformers movie this weekend. South Korea actually ‘closes’ the DMZ on Sunday and Monday for tours. These are also coincidently the only days a visit from the North is possible. It seems to be a recent policy. Is it an odd timeshare arrangement or a way to prevent opposing tour group confrontation? Waving and pointing does sound pretty dangerous after all. After being flushed from the room by an intimidating dual-formation of KPA (to the mumble of Korean, which I’m sure was lovely), we now had the opportunity to go camera crazy from the Punmangak Hall. Soldiers in formation marching towards the border with South Korea just metres ahead. We could also interact with North Korean soldiers who were more than willing to oblige, even sporting smiles on their faces. Smiling. In North Korea. Is that even a thing? It’s a bit odd. The entire JSA experience from the North is much more relaxed than I envisioned. Call me ignorant, but I honestly expected serious faces and five quick controlled minutes watched by on-edge Koreans yelling and shaking their arms each time I made a reach for my camera. Does it look like that to you? Two KPA officers and I. They were more than happy to take a snap and crack a smile. It was quite the contradiction to visiting from the South. Most ironic considering North Korea is the scary, mysterious and volatile boogeyman played up for the tourists on the South Korean side of the DMZ. Dress code applies! Don’t point here, don’t wave there. No laughing. Serious faces only. Don’t provoke the North Koreans! They will shoot you at any moment. Please sign this waiver as you’re heading into a volatile area. We can only stay for five minutes as it’s too dangerous otherwise, you may start a nuclear war. You better have your cameras ready, but for the love of God please don’t take photos of that. Taking photographs there breaches national security you know? No dress code, relative freedom to take whatever photos you like, go selfie crazy even, hell, take some photos with the military. Disperse from your group, your guides, and have a wander around. Wave, point, make hand signals, the lot. Laugh, even. Anything goes as long as you don’t cross that damn line. It’s great stuff. Fear-mongering stereotype reinforcement from the South, while on the North side they’re adamant in trolling you into a false sense of freedom and security. North Korea want to appear level-headed, to make you feel comfortable, to present their side of the story and specifically perpetuate the idea that they’re being persecuted more than the Jews have ever been, that their free passage into the South is being restricted by South Korea and the Americans despite their ‘best efforts’ at reunification. The DMZ to any of those visitors from the North is this evidence. And, frankly, they do a good job. Indeed it’s peaceful, reasonable and easy-going on the North side of the DMZ. As a result, it makes a mockery of the precautions taken by the South; in this moment North Korea certainly doesn’t appear to be the monster we’re led to believe and I couldn’t help but feel this to be a calculated move, part of the Pyongyang propaganda machine that would be no coincidence. If there’s one thing this country has mastered, it’s how to fool your perception. The JSA in the DMZ is truly an eerily peaceful smokescreen to the ongoing hostility. I entered expecting two bitter military forces antagonising each other to find that instead, they’re provoking one another not with nuclear warfare, but by using their finely-tuned gardening skills on well-kept lawns and plants. It’s like a little competition on who can manicure the biggest hedge. I’d sooner pull out a picnic blanket with a basket of cheese and biscuits here than reach for a machine gun in this ‘active war zone’. Which is what it technically is. To quell some JSA misconceptions before we finish this tour: There are no guard towers. There is no barbed wire or electric fencing. There are no active servicemen brandishing AK47’s and there are no visible Soviet tanks, military choppers or anti-air installations, nor sharks with frickin laser beams on their heads. There are, however, surveillance cameras. Lots of them. They face us from the ‘Freedom House’ in the South. Nothing speaks freedom more than a building with spy cameras. Thanks, America! Seriously, the JSA is labelled the ‘Truce Village’ for a reason and it, surprisingly, lived up to it. The actual militarisation noted above (with maybe the omission of the sharks, but we can’t be sure with North Korea) are set back in the DMZ hidden from view spread 250km across the peninsula. I saw some of it through binoculars during my visit to the ‘Concrete Wall’ further along the DMZ, where North Korea attempt to recreate the Loch Ness Monster. 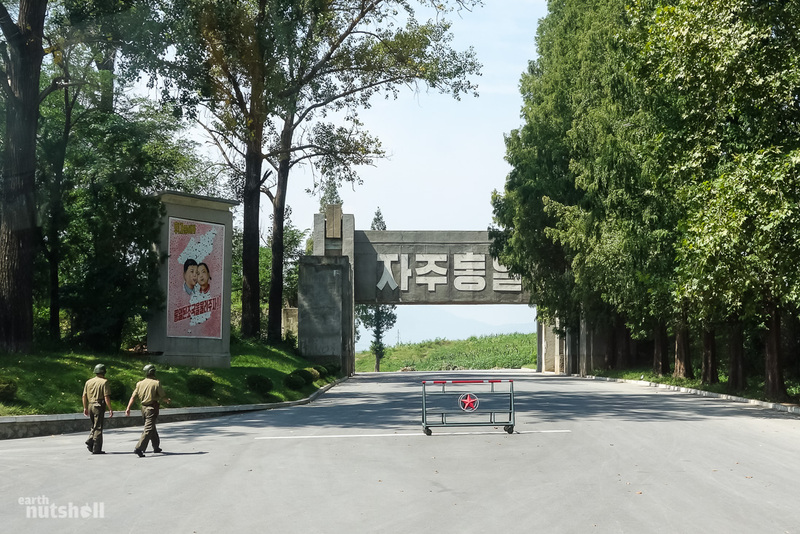 I did a write-up on this weird visit, so if you enjoyed this article, enjoy North Korean misdirection or are reading this because your teacher has you doing a school assignment on the split of Korea, click through here. It’s not as long, I promise. So that’s the JSA and the DMZ, folks! And well, that wraps up my time and your tour here of the Demilitarized Zone from the North Korean side. What a fantastic morning it was. We got the tap on the shoulder, and it was time to say goodbye, waving to soldiers smiling as if departing a family Thanksgiving lunch. Thanks for coming. Thanks for having us. Speaking of which, it’s only 12:30 pm, lunch was next in Kaesong and in true North Korean style we had a whole day ahead of us to fill. On a tour in North Korea they run you knackered so you’ll be too tired to even consider defecting from your hotel! 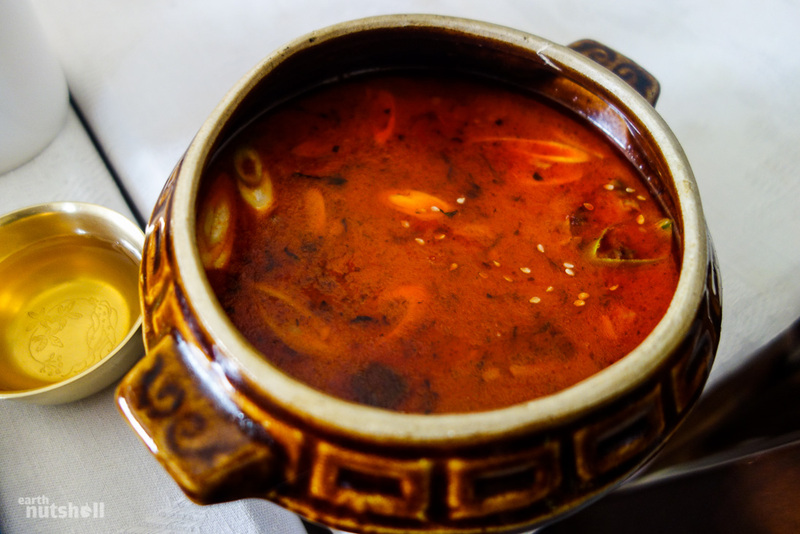 Todays lunch in Kaesong turned out to be Dog Meat Soup. A fellow tourist even found a tooth inside his serving. P.S – Thanks for reading! It’s long, I know. If you enjoyed it, make sure to share with the buttons below! I’ll be releasing more North Korea content soon. Follow on Facebook or Twitter to stay up to date! P.P.S – Have any of you travelled to the DMZ yourselves, from either the North or South? How did your experience differ? I’d love to hear about it in the comments. Cheers guys, Elliott. Want to visit North Korea for yourself? I can help. 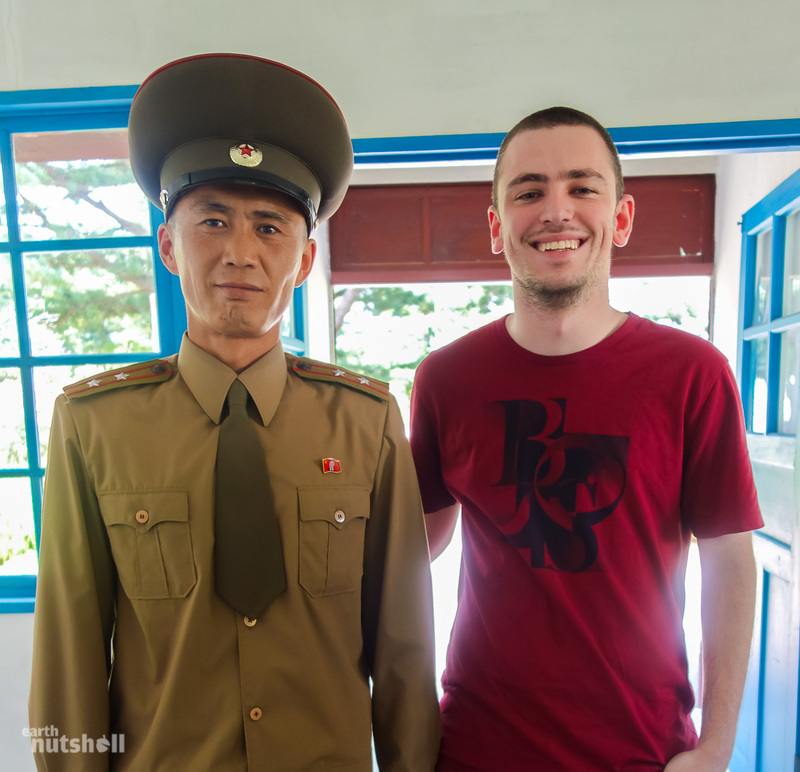 I’m the tour director at Uri Tours, a North Korea tour operator. For inquiries you can contact me directly at [email protected]. Interested in North Korea? More coming soon! Follow me on Facebook! Elliott believes each country on earth offers a uniquely interesting travel experience worth having. Inspired by contemporary history, news media and international politics, he likes to visit and see for himself. He's a poor golfer, tour manager, part-time software developer and has grown alongside one of Australia's oldest wombats. Read more here! Hello Ellot , Reading this all the way from Nigeria, i absolutely loved this right up , i actually felt they i was there the pictures were great too!!!!! Great look back and great photo’s. Served two deployments there; the first began in late August 1953 shortly after the cease-fire was put in force. We landed at Inchon and made shore in Landing Craft, pitch black, Deuce & Half trucks for near the rest of the night through a network of Check-Points. Finally dropped of at my Unit, 5th RCT, 555 FA Battery. Most of that deployment was spent at, or around the Chorwon Valley against the DMZ in the area lost by North Korea and far above the original 38th Parallel. As NK immediately began moving large offensive weapons into hardened sites on their edge of the DMZ, those movements triggered Red Alerts by our Battery so frequently, it seemed like it became a regular routine. Wherever there movements were, that’s where we moved and targeted or Gun Battery in the event shooting began. At first, hardly anyone believed the cease-fire would hold, since the Chinese agreed to it and NK had to go-along. Our Unit was pulled off the Line in 54 and moved to Pusan. At first it looked like we were being re-equipped, then that stopped and I believe our Unit was one of the first to be withdrawn from Korea. We later discovered, that about that time, Isenhower was being pressed hard by the French to send US Troops to support them at Dien Bein Phu (likely not spelled correctly”, and by the grace of God, he turned them down. My second deployment came in 55 when my MOS was declared “critical”, and I was immediately reassigned as a Staff SGT back to the Far East Command, and wound up in the First Field Observation Battalion as Platoon Sgt. of Head-Quarters Communications. That deployment lasted until early 1956, when I was rotated back to the States. Korea had undergone dramatic changes by then, but it was still considered a War Zone, and the North Koreans were still busy burrowing tunnels under the DMZ that an Infantry Vehicle could drive through. We found several, but no telling how many still exist. I wouldn’t take anything for the experience of those deployments approaching 2-years, but I was sure as hell glad when they were over. God Bless our Warriors. Thanks, Elliott: Very interesting article. I served with Hdqs Troop 1st Sqdn. 9th Cav. 1st Cav. Div. in 1964 for 12 months there. We wore a patch designating us as DMZ police. We provided security for Freedom Bridge north to Panmunjom/JSA, as well as the DMZ proper from there to the mouth of the Yellow sea. My, how things have changed in the last 53 years. Things were much more primitive back then. All buildings were quansets, and the building the meetings were held was also that way with the meeting table with a red line down the center. North enter north door, South from the other. Freedom Bridge across the Imjim river was the old railroad bridge, but pillars of the old hiway bridge that had been destroyed during the fighting still stood. The atmosphere was a ever-present feeling of readiness and caution. I understand American Troops no longer are on the “Zone” and all has been turned over to S.K. Thanks again for the great update, from an ol’ Trooper who has “been there-done that”‘. I came home with a different perspective of the “Good ‘ol U.S.A. We don’t know how blessed we are. Good pictures with a nice story of a long journey. This reminds me of the division of Germany. Greetings from the “City of Bach” Köthen, the former East of Germany. I’m just wondering… what is your nationality? wow, amazing,! all what and who’s in my mind answered by this post. its like I read a history book with actual vision GREAT! I felt like i was there. With the return of the detained comotose American who died..and the detentions of others i know North Korea is not in any of my upcoming travel plans.. But in reading your stories..and seeing all the photos i truly feel like i visited there. Earth Nutshell. Copyright 2017. Contact: [email protected] - Flags by IconDrawer.